Across the country, it is quite literally just another Monday — but don’t tell that to Boston. It’s a day rooted in history for the region, as Patriots Day commemorates the first shots fired at the battles of Lexington and Concord, which started the Revolutionary War. Today, the only shots fired are those of the starting gun in Hopkinton to kick off the Boston Marathon, which has taken place on Patriots Day ever since the first race in 1897. The Boston Red Sox also take part in the festivities, as they have held an 11 a.m. first pitch at Fenway Park every year since 1959 on Marathon Monday. However, for the first time since 1984, the Red Sox game was postponed due to rain this year. The marathon and the baseball game remain two highlights for the city, obviously, but there really is something for everyone on Marathon Monday. There is a certain electricity around the city no matter where you are or what you’re doing. It truly is Boston’s day. You didn’t need to see a pitch at Fenway or even witness a runner cross the finish line on Boylston Street, just getting out and experiencing the city is all that matters. There is nothing like walking down the Commonwealth Avenue Mall in Back Bay on Patriots Day. It’s crowded, but there is an energy to the city that can only be experienced Patriots Day. It’s as if every year, Boston hosts one day of the Olympics. Never mind the competitors or the ballplayers, the people and the crowds that the Marathon attracts are like nothing else. Yes, you can go to Bruins or Celtics game and there will be 17,000 people there, but it’s just not the same. The energy in the city is something to behold. It seems that, on a nice day for the Marathon (unfortunately this year it was not), the entire population is out and about taking it all in. The energy of the city can be your cup of coffee that keeps you going. On a good day, like I said before, you don’t even need to watch any of the race — the experience of the city is enough. There is a special feeling around the hub that only comes around once a year. Due to the rain, this may have been dampened a bit, but even through the showers, there was still a buzz. Maybe the Marathon was your thing. Maybe you loved the competition. Maybe you went to see the winner cross the finish line. 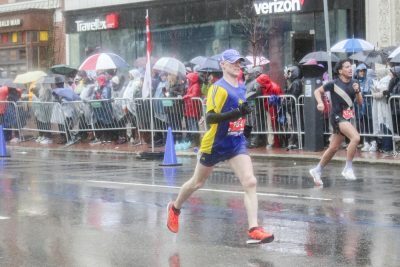 Maybe you wanted to just watch in awe as people put months and months of training and preparation into action, and complete 26.2 miles of running in a freezing rainstorm. Yes, 26.2 miles. Let that sink in the next time you complain to someone that you have to walk from West Campus to Questrom. The sacrifices that people make to complete in the Marathon are astounding. It takes extreme dedication and incredible mental toughness just to will yourself to get up and train each day. Training that will inevitably take place in freezing cold temperatures, snow, rain and sleet. If it’s pouring rain and the training program calls for 15 miles, I guess you’re going to get a little wet. And those training days set in horrible conditions certainly get you ready for days like this year. However, the top runners, who finished absurdly close to two hours of time, have never been the main heroes of this race. Yes, the winner got the olive wreath on their head and a shiny medal, but that’s not what this race is about. It’s about the guy in the office who gets up at 4 a.m. to train before work and comes home to a wife and two kids. Or it’s about the woman who has lost a family member and used the race as a fundraiser. No one cares how long it takes them to finish, just getting to the line is all that matters. Despite the rain, I hope some of you took some time to walk around the city and take everything in. I hope you got the chance to watch some of the runners trot through Kenmore Square. Maybe you grabbed some food and walked along Commonwealth Avenue. No matter what you did, I hope the weather didn’t force you to just sit inside and take the day off the school calendar gives you. Regardless of the conditions, Marathon Monday only comes around once a year.